A Nova Scotia program is bringing the gift of music to people in Canada`s remote northern communities. 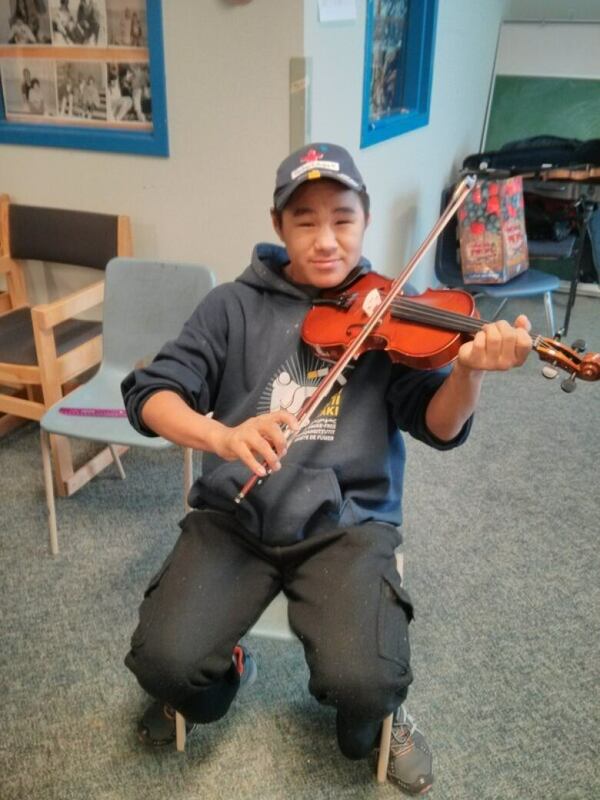 The Music for the Future program, also known as Tusarnaarniq Sivumut, provides violins, guitars and music lessons to children in remote northern communities in Nunavut. Nova Scotian Julie Lohnes started the program in 2007 when she was living in in the community of Pond Inlet on Baffin Island. 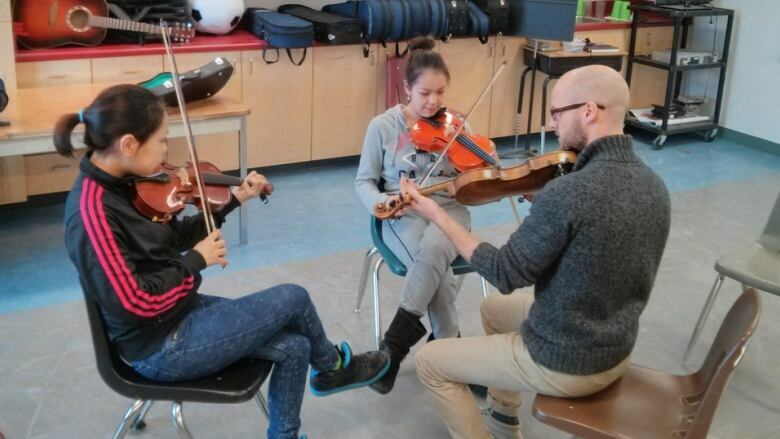 Since then, musicians like Nova Scotia's Greg Simm have been traveling to Nunavut twice a year to teach students how to play. "I was impacted by the warmth of the community and the interest of the students, their ability to learn, their eagerness to learn, their hard work and their commitment," said Simm. "Every community I go to I see youth that just want to play music. It reminds me a lot of myself growing up in Hants County." The program has bought and delivered about 40 to 60 instruments to students. Most are violins but some guitars have been purchased as well. "These are bought from funds that we raise during our primary fundraiser in November. What we try to do is buy quality instruments so that the kids want to play them. We don't want cheap instruments that don't work," said Simm. Six communities now take part in the program, which sees Simm and other instructors gathering the students together and teaching them how to play. One of the first students to take part in those lessons was Simon DeMaio, who used to live in Pond Inlet. Simon was too shy to talk, but his father Mike DeMaio felt it was important to tell CBC about his son's experience. "In that community and in most small communities on Baffin Island there's very little extra curricular activities for kids to do, maybe a little of sports. This is a big addition to the possibilities for kids up there," said DeMaio. DeMaio said many of the children who took part in the program still play the violin and come out of the woodwork when Simm and the other instructors arrive in town. "Anything that keeps kids from being bored at home or on the streets is always good. Music can be a lifelong hobby or even profession. It's an opportunity kids in small places don't get." Running the program isn't cheap though, a simple return trip to Nunavut from Nova Scotia can cost thousands of dollars, not to mention the extra costs of transporting the weight of musical instruments aboard planes, and paying instructors. The Music for the Future program has managed to get sponsorships to help cover those costs. Groups like the Seltzer-Chan Pond Inlet Foundation, Leanne Children's Foundation, the local schools and hamlets, and First Air — an airline in northern Canada — all help out. The rest of the money the group needs is raised through an annual fundraiser that the group holds in Lunenburg, N.S. That fundraiser goes ahead on Saturday at the Pearl Theatre. There will be a concert and auction featuring a variety of items including a long-neck banjo and a 12-string guitar once played Bill Langstroth. In the 1960s Langstroth hosted the CBC variety show Sing-a-long Jubilee. He played both the banjo and guitar on that show. "I think we live in a world where people say I wish there was something I could do that would have an impact. I can assure people that by supporting our organization they are having a direct impact on young Canadians,"said Greg Simm.